we opened our OLLA Orient Lounge in July 2004 ! ... a small oasis with oriental flair just as in "Thousand and One Nights", right in the heart of Berlin at the Hackescher Markt! The OLLA is meant to be a meeting point for orient lovers and sheesha fans alike, as well as to become a forum for Arabic artists and musicians! Of course family celebrations (Henna, engagement, wedding and birthday parties, class reunions...) and exclusive business events (caterings, buffet dinners, Christmas parties, meeting dinners, oriental multi-culti-nights, workshops...) are very welcome too ! 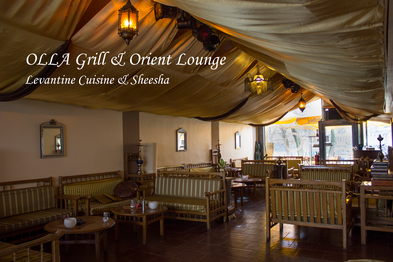 In May 2008 we have extended the original OLLA Orient Lounge (Shisha & vegetarian Snacks) by another arch right next to the lounge, our new non-smoking restaurant OLLA Grill, offering helal Levantine cuisine ! Thus, we now have separate rooms that can also be rented exclusively. And after 10 years we have given our OLLA a new facelift, the OLLA Grill & Orient Lounge 2014.....as an unlimited GmbH...experience and see by yourself! Italian for "sunrise", allegorically used for the "Middle East" and the "Orient". Today it stands for the Eastern Mediterranean region around the Mediterranean Sea - reaching from South Italy to Northern Egypt, inclosing Italy, Greece, Cyprus, Turkey, Lebanon, the historical region of Syria and Palestine, Jordan and Northern Egypt.